Being in the Eurovision family, TVR didn’t hold back when it comes to Eurostars being present at The Golden Stag Festival. So this year they have outdone themselves and we say a big Thank You ! for the wonderfull line-up they will present on stage in Brasov. Starting with the contestants, no less that 4 Eurostars will be competing on the Golden Stag Stage. But the most exciting part came in today when TVR announced the guest performances for this year. 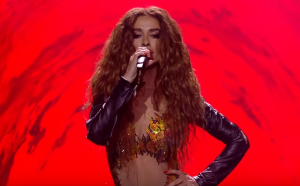 The biggest and most amazing news was that Eleni Foureira , who represented Cyprus this year and placed 2nd for Eurovision Song Contest 2018, will be performing live in Brasov – Romania. Another big Eurostar is the actual winner of Eurovision Song Contest 1964, Gigliola Cinquetti, who won the Eurovision with the song “ Non HoL’eta”. Other guest stars are James Blunt, Edvin Marton( Who accompanied Dima Bilan on stage in Belgrade for his winning performance of Eurovision 2008 ) and Amy McDonald. Among the Romanian artists who are going to perform are: Andra, Carla’s Dream, The Motans, Delia and more..